Found a nice garden furniture set on the Homebase website and found the exact same product (with a different name) for £100 less in Argos with a 5 day delivery waiting time. the Homebase set is £249 but with the Homebase price match guarentee they will match the price and give a 10% discount of the difference so £139 in total. If they try the old trick of "It has a different name" then please quote there price check policy of... "•The product(s) must be comparable in style, quality and structure"
The items are exactually the same so they have to honour the price. 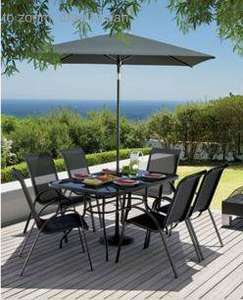 Now the free parasol base, on the homebase link click on "customer reviews" then a picture of a conrete parasol base will appear as a "we recomend" product. Click on the picture and it will show you a price of £0.00 try and get them to match the price in store. erm seems like a lot a hoops to jump to get this @ the price you have stated..if this has been done without any issues please share! Maybe I didn't put it right, the price match + 10% off worked, the free parasol base didn't. As for being a hassle, do what I did, open the Argos page on your phone an show them in homebase. Both are £199 now? Has this offer now expired?